Well, it’s official the dresses have taken over our house! 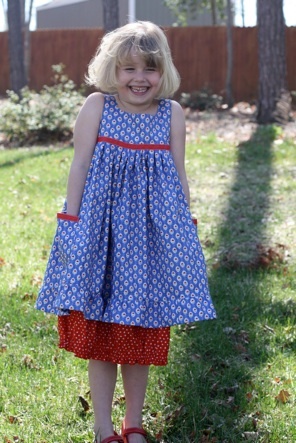 After 6 years of sewing for Abby I have managed to sew enough clothing for a small country. Needless to say . . . we have far too many dresses! I’ve decided to open a little shop here to try to find good homes for some of these beauties. All of them are like new and have only been worn for modeling purposes. They will range in sizes 4-12 and I will be adding new items on a regular basis so check back often to see what new items have been listed. All items are one of a kind and the size listed is all there is and I cannot reproduce any of them in different sizes as I no longer have these fabrics. Please ask for measurements if you are unsure that it will fit before you purchase it because all sales are final. . . in other words, “I don’t want them back.” Goodness knows, I need to clean out some of our closets and empty some of these gazillion containers of stuff. If you have any questions about anything listed here please don’t hesitate to email me with your questions and I will be happy to try to answer them for you. To purchase anything you see here please email me with your request and I will be more than happy to assist you personally. I can only accept Paypal and personal checks as payment and you will also be responsible for all shipping costs. I am happy to ship internationally, but you will be responsible for all fees included with that as well. A portion of all sales will be put into a special fund and will be donated to the World Wildlife fund in Abby’s name to aid in her cause to help save endangered animals. Enough with all the small print. Let me show you what we have! Remember I have literally hundreds of things that need to go!!! often some of the details are lost in the main photo. © 2009-2015 Olabelhe ~ All Rights Reserved. Web site design and all photography by Dawn Hansen. 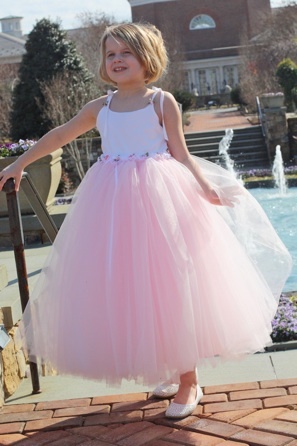 Beautiful Ballerina Princess style dress with layers of soft baby pink tulle and a white sateen bodice. Charming details at the waist with delicate trim, ribbon roses and gorgeous ribbon bows. 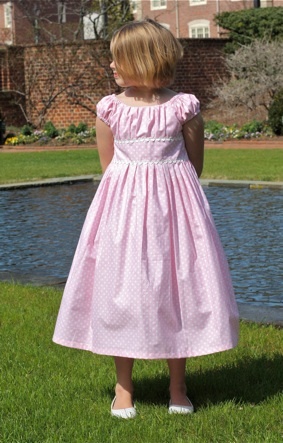 This charming dress is done in pale pink with white polka dots and is completed with the addition of whimsical white rickrack on the bodice. All done up in a fun and whimsical jungle animal print with lots of details. 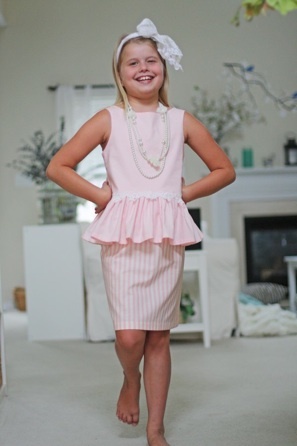 This one is sure to delight most young ladies who have style and a little sass. This classic jumper is bursting with charm and old fashioned styling with a bit of a modern twist. 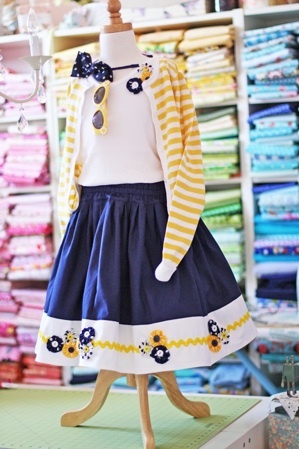 A perfect addition to your little girls wardrobe. Words cannot describe this charming outfit! It’s all about the details and this has tons of them!!! 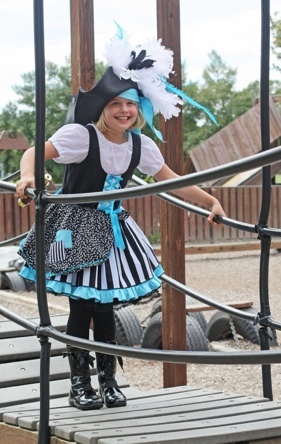 Perfect for a costume party or other special event. This one even includes the hat!!!! 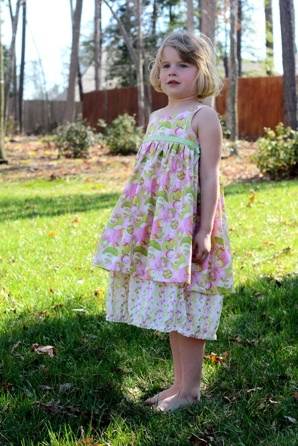 This elegant little dress is perfect for those hot and steamy summer days when she needs something cool and pretty. Features dimensional butterflies, ruching on the bottom hem and vintage lace. 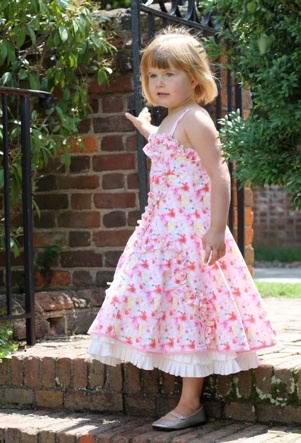 A darling halter style dress with beautiful details and a very full and twirly skirt. 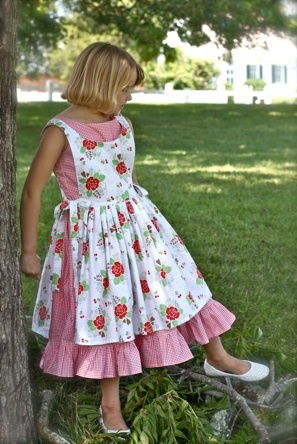 Perfect for a Sunday afternoon picnic in the park or a country dance. Ahoy! 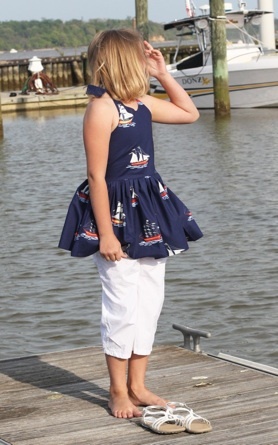 Paige all done up in a nautical print perfect for a day at the beach or sailing with the family. This one is simply adorable!!! Big, beautiful blooms make this dress extraordinary! Ask to see additional photos of the back of this dress as it is truly stunning and has lots of options for wearing it. Could it be anymore charming? 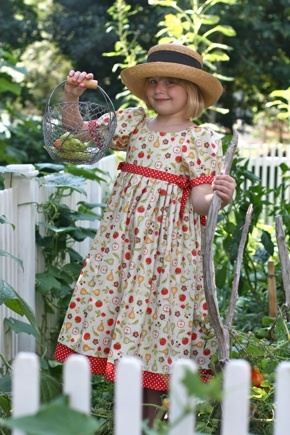 A classic little girls dress in a fun garden themed print with lots of details to make this one truly unique. Perfect for that upcoming special occasion! 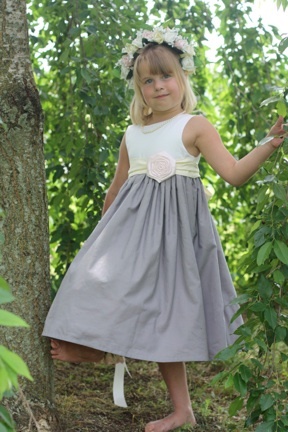 My popular Natalie’s dress all bone in soft gray, white, ivory and pale pink. Gorgeous details especially in the back. Ask to see more photos. This one is truly stunning. A modern twist on a classic dress. All done in black and white with details in Bright pink including a bright pink petticoat underneath!!!! So much fun and unexpected. I can’t believe I’m letting this one go..It’s truly one of my all time favorites and I spent hours ad hours making this one. Perfect for an upcoming wedding or other special occasion. Ask for more photos as this one does not due this justice...I promise you will swoon! 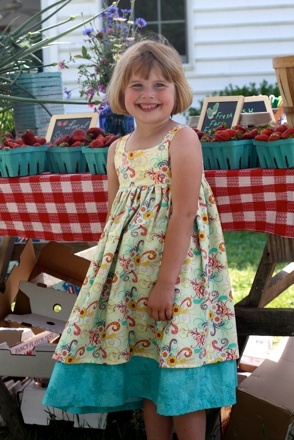 This dress is truly the perfect little sundress and is sure to turn heads and make your little girl just smile from ear to ear. Can be worn on it’s own or with a tank or “t”. Delicate, feminine, and classic what more could you ask for. 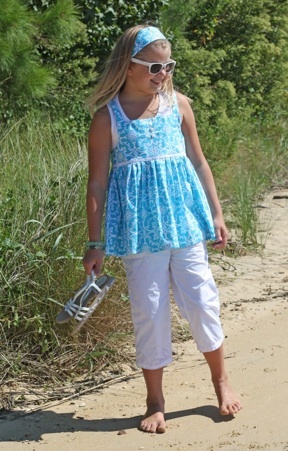 I love the soft colors and pretty little details in this outfit, and you are sure to as well. So sweet and classic, yet fun and comfortable too. 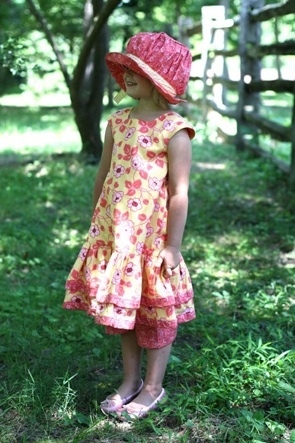 Your little girl is sure to love this one! Remember, please ask any questions before purchasing as all sales are final. I will be happy to email you additional photos by request and answer your questions. Thanks so much for looking. Check back often as I will be listing more items soon! church or a Sunday picnic. 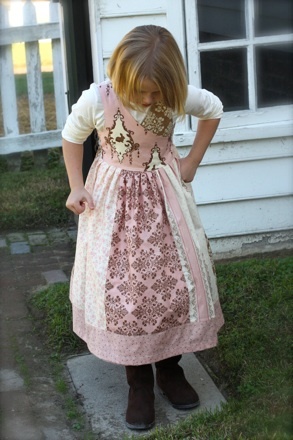 A pretty little Colonial dress with special attention to details. Gorgeous fabrics and delicate lace to accent the dress. Includes the hat which comes directly from Colonial Williamsburg! Fun and cheerful little sundress with pretty details on the back bodice. Cool and comfortable and ready for a hot and steamy summer afternoon party. 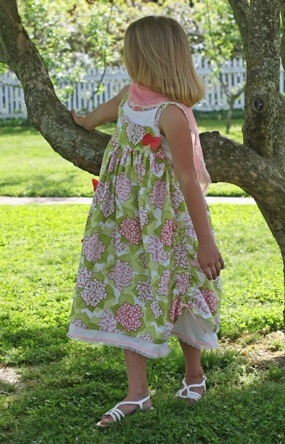 This little Sundress is so sweet with a pretty botanical print in a cool and refreshing color palette. This one is truly stunning and is sure to be a favorite. This adorable two piece outfit includes the charming swing top with gorgeous details and stunning fabrics and the coordinating little pants. Another of my all time favorite outfits. 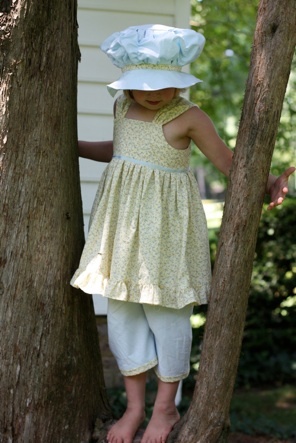 This includes all three pieces including the drop waist dress, pantaloons and cloche style hat. This one is gorgeous in person!! 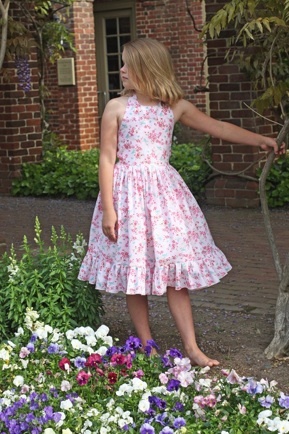 My classic Sabrina’s Dress made up in a stunning floral print. This dress has it all and is perfect for so many occasions. Surly to be a favorite. This outfit is truly darling and very unique. 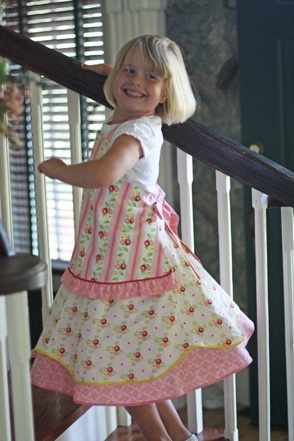 It features a darling apron top and a charming shirt to match. Ask for more pics to see the details. 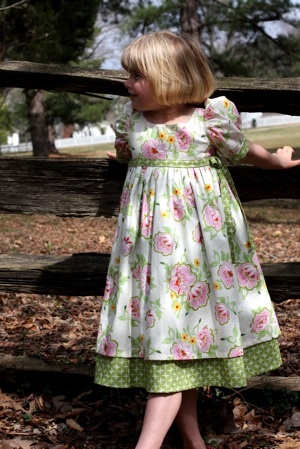 A sweet little sundress with pretty French fabrics. Cool and cozy and ready for all kinds of occasions. 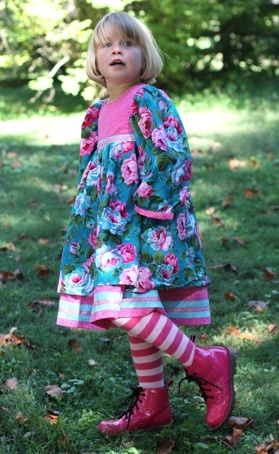 This is a fun outfit I created for a “Fancy Nancy Tea Party” So much with a pretty little petticoat and tons of twirl. it also features dimensional butterflies. 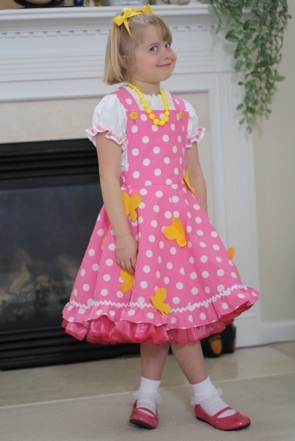 This one is very special and your little girl will love wearing it! 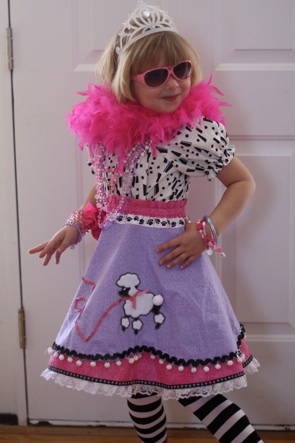 Another Fancy Nancy inspired dress, perfect for dress up or costume event. 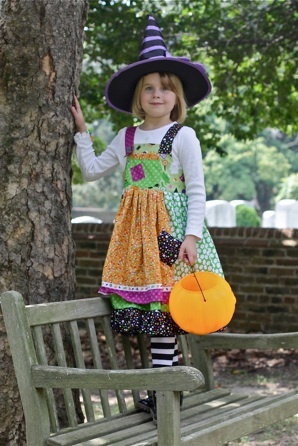 This one is just bursting with personality and whimsy! 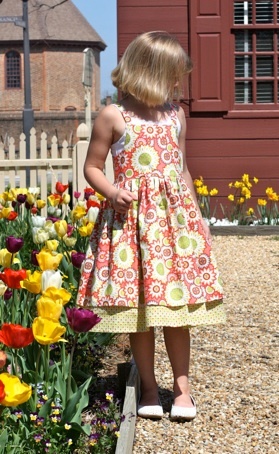 Made from my “Annikka” pattern I just love the beautiful fabrics and colors in this dress and so will you! Once again photos do not due this one justice. The fabric was imported from Europe and is spectacular. 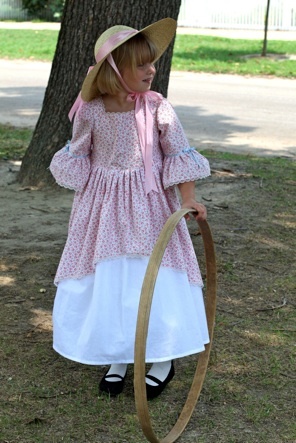 Includes dress, top and pantaloons. Could it be any sweeter? 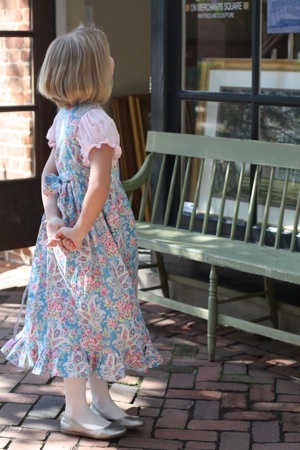 This outfit reminds of everything we love about old fashioned charm and innocence. 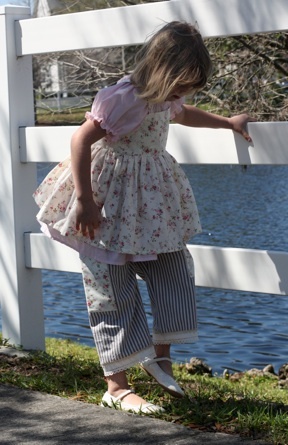 Includes top, pantaloons and bonnet! 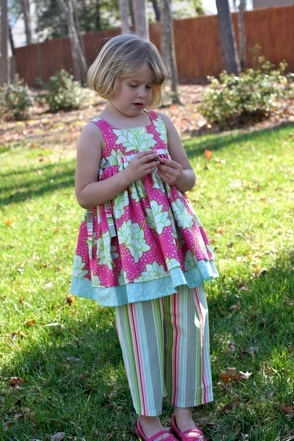 This darling set includes the top and the skirt and makes the perfect little summer outfit and the prints are just lovely! 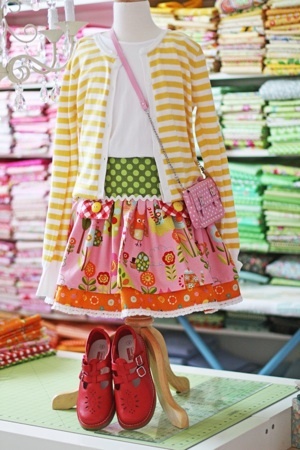 I just love this outfit and the fabrics just couldn’t be more darling. This includes the fun little swing top and pants and I have the coordinating custom jewelry and hair accessories if you are interested. Charming strip-work jumper in festive Halloween prints. Perfect for the Fall season! Stunning smokey blue gray formal dress with ivory lace trim and pewter buttons. Perfect for any special occasion or for a portrait. 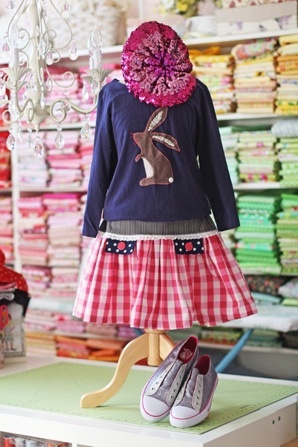 Stunning crossfront pinafore done in Beautiful Bunny Hill fabrics all in pink and chocolate. Ties in the back with a sash. 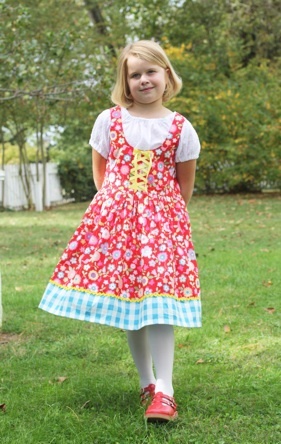 Adorable Alpine inspired dirndl in Cheerful Euro print fabrics with lots of attention to details. 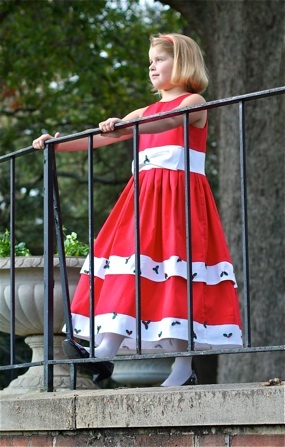 Spectacular Holiday dress made from silky red and white sateen fabric with tiny holly leaves and bead berries which have all been hand-sewn onto the dress. 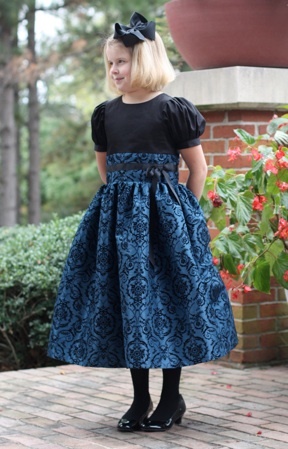 Black sateen and midnight blue flocked taffeta are the shining stars on this gorgeous formal dress. Perfect for any special occasion. 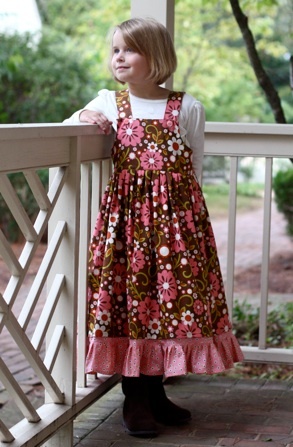 Pretty little jumper perfect for back to school or a perfect dress to wear to church. 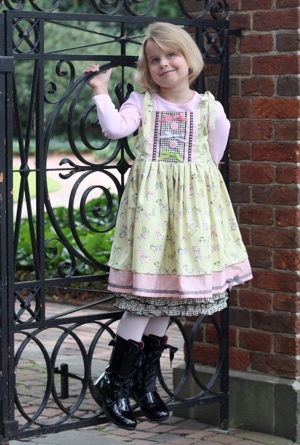 Adorable baby-doll style jumper with tons of little details and charming fabrics. 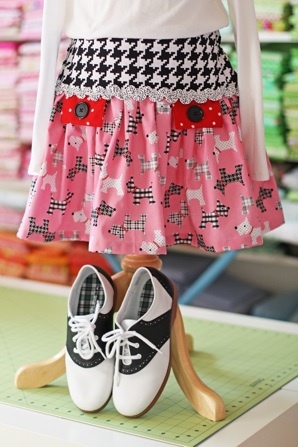 Comes with coordinating black and ivory houndstooth skirt with french ruffles. Drop waist dress with tons of personality and details. Includes matching capri length pants. 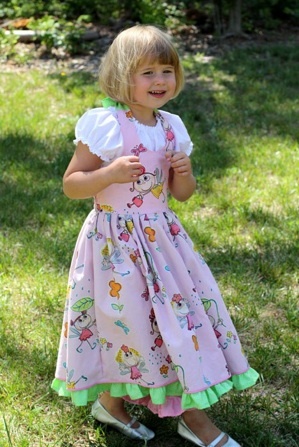 Gorgeous dress and pinafore set. 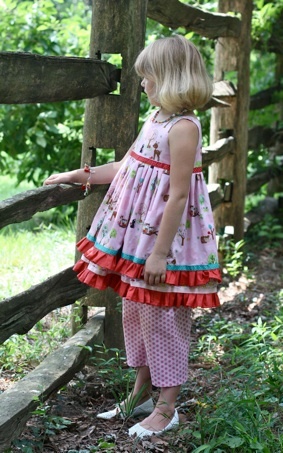 Red gingham dress with buttons all the way down the back and charming pinafore with ties on the sides. Absolutely Charming!!!! Stunning outfit all in neutral tones. 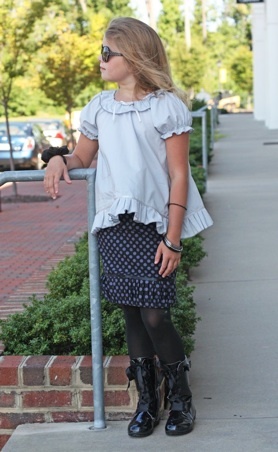 Includes beautiful ruffled peasant top and Tatum’s skirt in Black and gray. 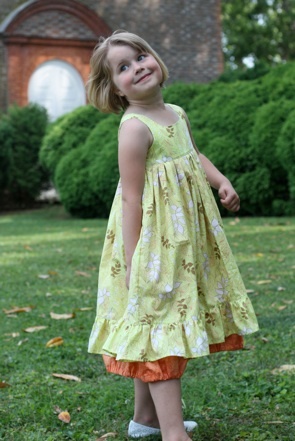 This is a darling skirt I was experimenting with but sadly it never became a pattern. 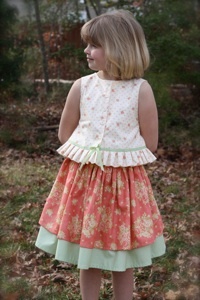 Lots of ruffles and ruching up the front makes this one just beautiful! 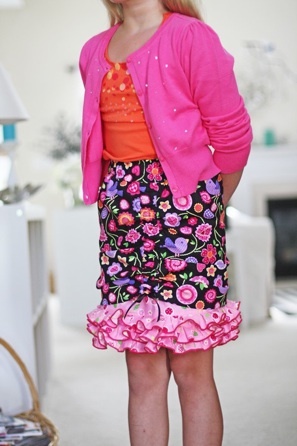 We fell in love with this skirt and had so much fun putting it together. 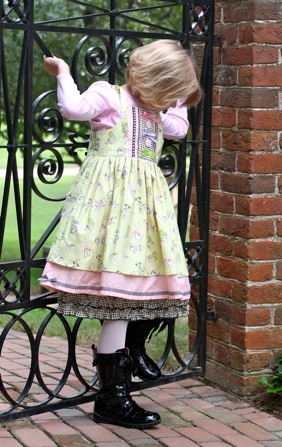 Loads of ruffles and ruching and fun Hello Kitty detailing. This one couldn’t be cuter! Gorgeous white pinwale corduroy skirt trimmed in black grosgrain ribbon and pretty black buttons. Black fur collared sweater also available (extra) This has never been worn and would be perfect for a special occasion! This was another test pattern and Abby and I both gave this one a big two thumbs up. Pretty swing top with gorgeous hand pleated detail on the bodice. This ine has buttons down the back. Who doesn’t love scotty dogs? I paired this one up with black and white houndstooth and red and white polka dots for a darling combination. This is truly precious! Sweet little skirt made from a fun print with charming little owls and whimsical flowers. Trimmed in white rick rack and crocheted lace. This one is stinkin’ cute! 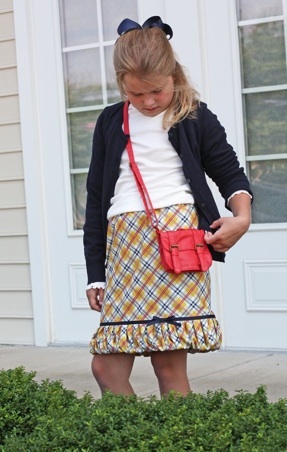 Tatum’s Skirt done in a preppy plaid perfect for back to school! 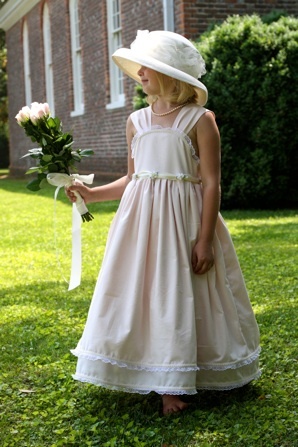 Stunning classic outfit in pale pink and ivory. Pencil skirt with slit in the back and pretty details with beautiful peplum top with delicate lace trim. 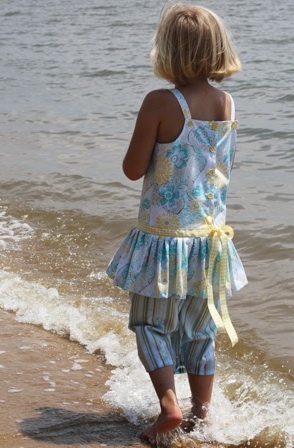 My “Emily’s Camisole” in a cool and refreshing tropical print perfect for the beach or a Summer party.